Did you see it? Did you see them? All around us, in the darkness, there are lanterns. Lanterns in the darkness that surround us. We peer into the darkness, squinting our eyes, attempting to make out a shape or hear a sound. We peer into the darkness trying to see who’s there. We peer into the darkness trying to see what is there. We look and look…we seeing nothing, but specks of light in an ocean of darkness. The walls of our lives are high…there are times we feel totally safe, as if the walls of our lives cannot be taken. Yet, as we keep watch in the tower that rises above these walls, we can’t help but notice the lights in the distance, those lanterns, flickering outside the walls of our lives. We are safe in here…yet out there, darkness creeps closer, and pressing against our lives…the darkness merges ever closer attempting to confuse the cities of our lives with the presence of the darkness. We see the lanterns. Still flickering. Still burning. In the darkness is the reminder that there is something pressing against us that we cannot make out, that we cannot see, that we cannot hear. Yet, there is it…it’s presence of the ominous light of silence. The lantern in the darkness letting us know all might not be well. Some of us may already see ladders mounted on the walls and we can only imagine what is it at their bottom, attempting to make their way up and occupy our cities. What is attempting to occupy you? What is it that is attempting to overcome you? What do those lanterns in the darkness mean to you as they move closer, and closer…ever closer to our presumed safety? What is that makes you shake as a tree in the wind when you hear its marching, see its presence moving closer, maybe begin to hear the faint war songs of those things that seek to take away all hope, all future, and all attempts of salvation? What are those realities in our lives that announce to each of us…let us go up and terrorize them! Let us breach their walls and overcome them! In our families, between husbands and wives who have forgotten how to love, and have instead chosen to co-exist. Between children and parents, who take one another for granted, ungrateful for the gift that they are to one another. Relationships that are shipwrecked on selfishness and torn apart by stubbornness. The absence of love…people who are so lost in each other’s presence that they are not even sure how to have a simple conversation anymore. The absence of economic certainty. Funny thing, in times of economic turmoil and strife, we often take our frustrations out on one another, when one another is all we have to make it through. Do you have enough or is “not enough” threatening your family? Is not enough the thing that keeps you from being happy? Do our pursuits for economic certainty get in the way of us finding ourselves, seeing our loved ones, or cast a vision of the world that simply creates another version of, not enough? 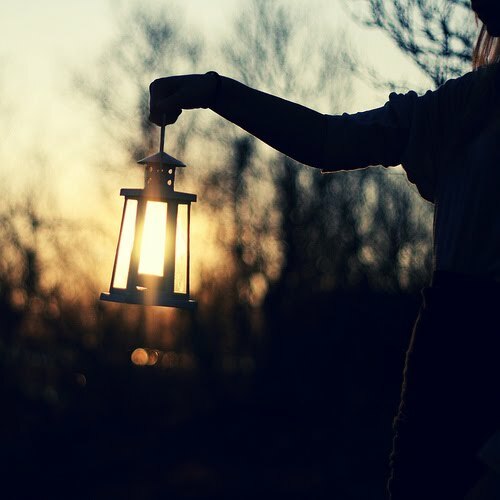 What carries the lantern and reminds you that it is always there? As we stand here, in our cities, worried about what is drawing near and camping all around us, seeking to overtake us at any moment and throw our lives into the abyss, we hear a word of the Lord. And the word of the Lord is…have patience. You may see these things lurking outside your walls. You may be hearing them try to convince you that there is no deliverance…there is no hope…there is no answer to the problems that fill our lives and threaten to break our relationships. And here is the beautiful thing about Advent: Advent happens in the midst of occupation; in the midst of a threat to our lives! Advent is God’s statement that when the world seems bleak, when your life seems to be threatened, when you have more questions than you have answers, when brokenness and loneliness is attempting to fill your home, when temptation is seeking to become a permanent fixture in your daily existence…when it seems like the terror you’ve been living with has no end…just then, at that moment, when you are unsure about even asking God for a sign…God gives us one anyway and his name is Immanuel. God is coming to dwell with us Church. When it would be easier for God to leave us alone to the mess we’ve made, our God makes himself known not as one that determines our lives in some far off place, but as a God that knows that only one answer will do: Immanuel. For indeed, many just men, women and prophets have wished to see what we see and to hear what we have heard…lives spent in anticipation and expectation longing to see what we see and hear what we have heard and experience what we have, and are, going to experience. As the lanterns burn around the camps of our lives: Emmanuel. God with us. Amen.